When Diana Damrau debuted at the Metropolitan Opera as Zerbinetta in Strauss’ Ariadne auf Naxos, her silvery instrument seemed inexhaustible. Gorgeous! Youthful! She could do anything with that athletic, vibrant sound. She twisted out the most flexible, ornate phases. Her instrument was bright, yet cultivated. It moved. It spun. It gracefully leapt into stratospheric tessitura. It worked with a wide palette of color. When she returned to the house a year later, in Il barbiere di Siviglia, she proved her technical agility with a proficient, yet comically sophisticated Rosina. And she repeated her expertise as Aithra in Die Ägyptische Helena. Both Queen of the Night and Pamina soon followed (roles which she, astoundingly, performed in the same run). She was an exceptional artist. She was reliable and creative. Not only could she get through difficult repertoire like Queen of the Night and Konstanze, she could do it beautifully—with style, class, intelligence. And so it is regrettable to see her come to this. Her most recent performance as Violetta, in Michael Mayer’s new production of La Traviata, was the work of a very ordinary artist, one susceptible to vocal flubs, poor intonation, and an all too banal approach operatic performance. Mayer’s production is set firmly in the 19th century. However, Damrau’s Violetta was suffering from a more modern emotional disorder we might call Jessica Lange Syndrome, replete with tics and jitters. She seemed neither engaged nor inspired by Alfredo’s love (apparently nothing could rouse the character from her bourgeois ennui). In fact, Damrau’s approach emptied the character of subjectivity; her performance was dull and uninteresting. However, the flat characterization may have resulted from a preoccupation with vocal production. Her singing was pretty wonky. Gone was the lustrous, vibrant color of her higher register; gone were the spin and squillo, the precise intonation, the flexibility; and gone was the legato, that beautiful line that seemed to extend indefinitely. Instead, only the middle voice offered consistent beauty. And while this was a pleasure, it was not enough to justify a performance in a role that could have been tackled with more finesse by any other lyric soprano. Luckily, Damrau was an anomaly among her colleagues. 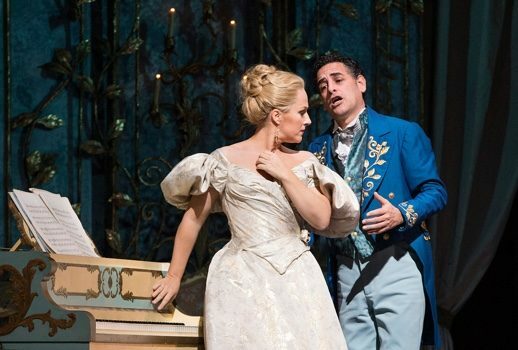 Juan Diego Flórez was quite on-brand: youthful, ardent, vocally dazzling, and charismatic. Confident, perhaps, from his recent success at Carnegie Hall, his Alfredo was a lyrical antidote to Damrau’s gracelessness. And Quinn Kelsey, as Germont, sang with booming intensity. Kristen Chávez and Maria Zifchak brought sturdy, if ordinary support in their roles as Flora and Annina. If Michael Mayer’s production does succeed, it’s in an overproduced, unimaginative (but not unpleasant) way. A departure from the former Willy Decker version (which, in my opinion, was ideal in many respects), it presented a jewel-toned pallete of sumptuous fabrics and textures: gilded filigree, rustling dresses, glitter and light. It was like a theme park attraction (“It’s a Demi Monde After All!”): well made, but vapid—entertaining, yes, but not necessarily artistic. The stationary set consisted of bedroom furniture—ostensibly Violetta’s boudoir. And all manner of figures rudely traipsed through this private sphere, including Germont, Alfredo, and all of Parisian high society. This concept rests clumsily on heavy-handed symbolism. As the opera began, the audience was presented with Violetta on her deathbed, and so the actions that followed were framed as one continuous, febrile recollection. The bed sat center stage throughout the evening. It bluntly indicated towards Violetta’s sexuality and death. And its centrality, throughout all three acts of the opera, blurred the lines between public and private transactions, suggesting the profane commercialization of Violetta’s body. The absurdity of certain scenes, played over and around this space, highlighted the indeterminacy between the character’s exterior, public persona and her interior, psychological suffering. Another notable intervention by the director was the silent presence of Germont’s daughter, Alfredo’s sister. Dressed in white, passively wan and unremarkable, she suggested a foil for Violetta. The gesture clarified the protagonist’s social failure: where Violetta was febrile and autonomous, Germont’s daughter was docile and dependent. This was an interesting comparison. However, the character only appeared onstage intermittently. In Decker’s bolder, more austere production for the house, Dr. Grenvil silently stalked the heroine. His constant, haunting presence reminded Violetta and the audience of the pressurized crisis of her health. Certainly, one could argue that the choice was heavy-handed, but I admired the moxie. I think, in this most recent production by Mayer, Germont’s ghostly daughter might have made a stronger impact if the symbol were used more deliberately, more consistently. As it was, the choice felt muddled and half-hearted. Amid these bursts of brilliance and mediocrity, it was hard to remember that the evening was, in fact, a gala performance. And indeed, history was made as Yannick Nézet-Séguin conducted for the first time as the Met’s Jeanette Lerman-Neubauer Music Director. As noted in the evening’s program, Nézet-Séguin is only the third Music Director in the company’s history. In light of the honor, I found his conducting polite, but boring: slow tempi with polished, restrained phrasing—unidiomatic for Verdi. As the diminutive Nézet-Séguin came to the stage for his curtain call (he is cute), two cannons, on either side of the stage, glittered bombed him to mark his apotheosis. And he generously invited the orchestra to join him onstage to receive their well-earned applause. It was lovely; it felt important; ushers handed out champagne in the lobby; ding-dong the witch is dead. As the company celebrates Domingo’s 50th year at the house, I am hopeful (and perhaps naïve) enough to think of Nézet-Séguin as a new beginning—a fresh presence, a new voice in a conversation that has been going on for over 40 years. And one wonders on the difference this change will show in the company’s future programing and casting.